Weymouth isn’t just one of Dorset’s most famous seaside towns, it’s one of the nation’s favourite beaches and has been for hundreds of years. It’s easy to see why. 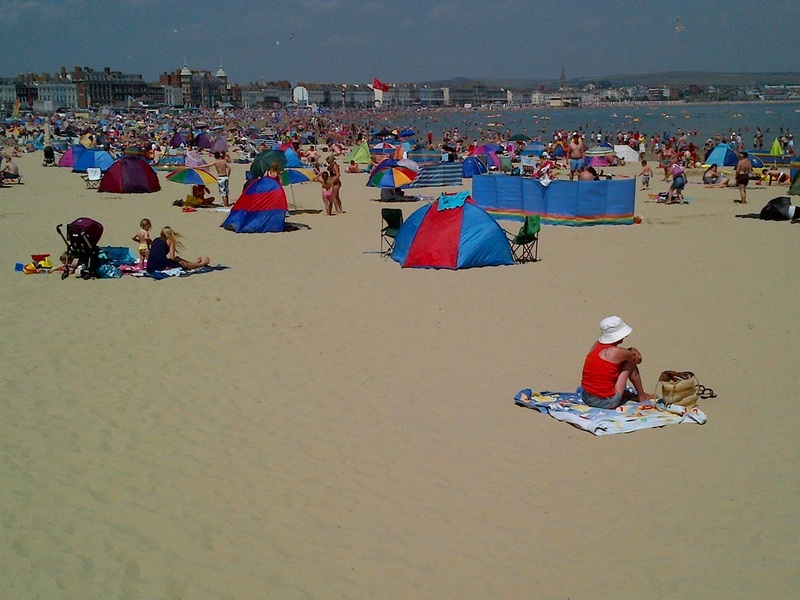 Weymouth has one of the best beach combinations in the South West. The natural sweep of this South-facing bay covers sand and shallows to the West with an increasing proportion of shingle as you move East. This mix means that whatever sort of beach you prefer you’ll be able to find it along this stretch of shore: from building sand castles, swimming, ornamental gardens through to windsurfing, water-skiing and jetskis. 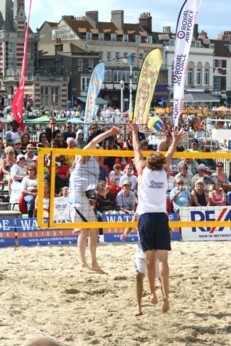 You’ll also find a range of organised beach-based events from volleyball to motor-cross! The most Westerly end of the beach is where you’ll want to take young kids if they want to play in the sand. This is real bucket and spade territory and they’ll have hours of free fun building sand castles and knocking them down or trying to bury you up to your neck. This part of Weymouth Bay is also where the shallowest and most sheltered waters are, which means the water warms up quickly in the summer sun and it's great for paddling. At low tide you can walk quite a long way out into the sea and still only have water up to your knees. It is also the most commercial part of the beach, with the sands spreading right back to the promenade and the sea-front Hotels that overlook it. This is where you’ll find the amusements, the kiddies rides and the greatest concentration of ice-cream and candy-floss sellers. This end of the beach remains, in high summer, the essence of the English seaside holiday -families playing in the sand; elderly couples sitting in deck chairs; teenagers and twenty-somethings getting a tan and, of course, Punch and Judy and pedalos. It’s a formula that’s worked for generations and it still takes some beating today -especially if you have children. For younger kids the sands are a fantastic place to play. There’s a temptation in the modern world to think that if it hasn’t cost you money it has no value, but just like the well-known phenomenon of kids getting more fun at Christmas out of the box than the expensive present it contained, so it is with Weymouth Sands. You can go there with next to nothing and children will be instantaneously enthralled by by what’s around them, lots and lots of the finest, most wonderful sand you could ever wish for. And should you tire of messing about in the sand for yourselves, why not go and see what the experts can do with a bit of Weymouth beach. Weymouth has its own resident sand sculptor, who’s always got a major masterpiece either on display or under construction. It’s well worth a look. It’s often said that Weymouth’s hey-day was back in the 18th and early 19th Centuries when Weymouth and its beach was a favourite spot for King George III to hang out. Certainly George’s Royal visits did much to enhance the reputation of the town at the time, and the architectural legacy of Weymouth’s Georgian popularity can be seen along the length of the sea front today. 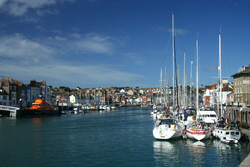 But Weymouth has evolved as a holiday destination and if it ever had a hey-day, it is one that has been extended throughout the centuries to the modern mix it is today. The town and its beaches have retained the best of what we all still enjoy about the traditional English seaside holiday, but it also offers a whole lot more. The sands have become an excellent venue for numerous events, some outside of the main holiday season. 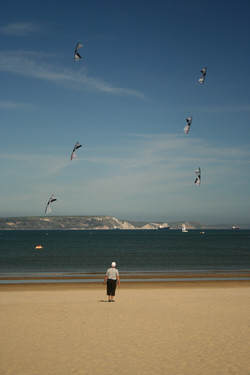 The curve of the promenade, which overlooks the sands, makes it a scenic viewing point for watching the Weymouth International Beach Volleyball Tournament, the Weymouth International Kite Festival as well as noisier events like beach motorcycle autocross and the annual beach assault reconstruction. Not to mention regular firework displays and competitions. And Weymouth Beach was, of course, one of the “Live Sites” used to entertain the crowds during the 2012 Olympic Games. If you want to enjoy the beach away from the hustle and bustle of the sands and Weymouth town, there’s plenty of room to spread eastwards on to the shingle of Greenhill and beyond. 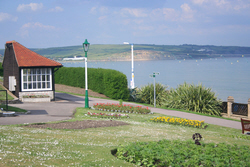 This area can be reached easily via the promenade along the esplanade which now links to an extended walk along the top of the beach all the way to Bowleaze Cove. This route will take you past Greenhill Gardens, where, in addition, to beautifully tended gardens overlooking the bay, you’ll find public tennis courts and greens for putting and the Weymouth Bowls Club. On the seaward side of the beach, you’ll also find various areas marked out for different activities. 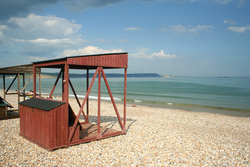 Weymouth Bay is, for the most part, a designated bathing beach (and one that is well-known for the quality of its water). In these areas there are safety and speed restrictions on all other users enforced by local by-laws. But the beach also offers areas for wind-surfers and board-sailing (and these days increasingly kite surfers); water-skiing; and jet-skis and other personal watercraft. Most of the windsurfing activity goes on down at the easterly, Preston end of the beach, by the Cafe Oasis. There’s designated parking and specified access channels out into the bay. For jet skis the designated launch area is in Bowleaze Cove itself. So if you don’t want to fall foul of the local laws, make sure you stick to the rules! For younger kids the sands are a fantastic place to play. There’s a temptation in the modern world to think that if it hasn’t cost you money it has no value, but just like the well-known phenomenon of kids getting more fun at Christmas out of the box than the expensive present it contained, so it is with Weymouth Sands..​"